PC1 is a symmetric encryption algorithm which uses variable key lengths (40, 56, 64, 80, 128 or 256 bits). Currently, 256 is the maximum key length used in PC1 encryption as it does not require lengthy keys. We use symmetric algorithms to securely exchange passwords. We can also call this as Pukall cipher as it was developed by Alexander Pukall. If you are considering the other ciphers which use the same key length, PC1 is a better option in terms of security factors. This encryption algorithm was designed originally with a key length of 80 bits in 1991. But according to the security constraints and challenges with time, the key length was upgraded to 128 bits and later to 256 bits. 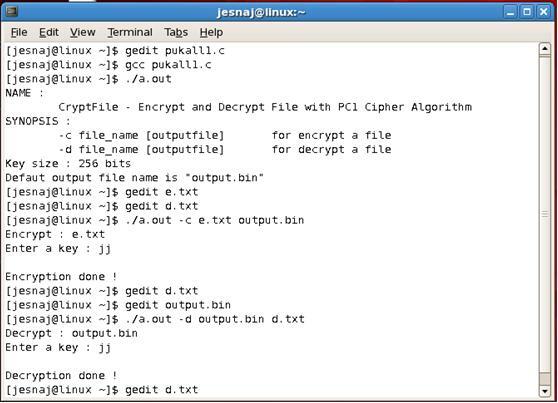 The encrypted text is stored in output.bin and is decrypted to the text file d.txt. Open this text file to get the decrypted text.